For the last five weeks, I have stuck with my original plan and been looking for a boat to get to Madagascar. However, there have been no good news so far. Now it’s a moment to decide.I’m no longer traveling by a boat. I will take a flight next week. The cost for the flight is huge but I can’t miss the appealing big island. I want to thank everyone who has been trying to help me finding a passage there. The clatter from my bicycle chains ceased. 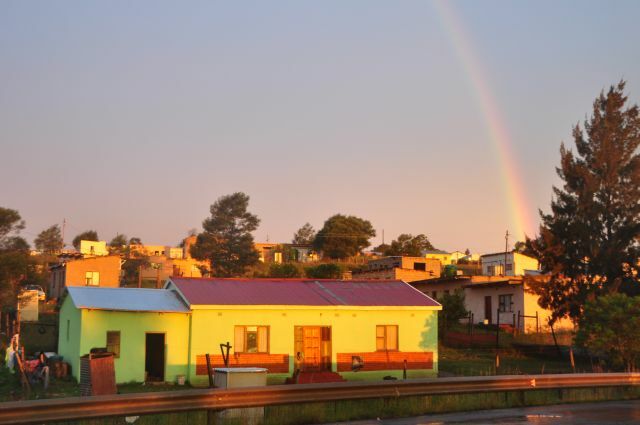 I found myself having stopped pedaling and looking up at the sky after the rain had fallen in Mthatha, the capital of ”Transkei ”,its name comes from one of the homelands in the apartheid era, where a big arch of rainbow had appeared. I had my headlight on before I reached the center of the town as it had been getting dark. When I was waiting for the signal to change to green at the crossroads, I noticed an African cyclist coming close to me from the counter direction. The instant that our eyes connected, we smiled with each other. 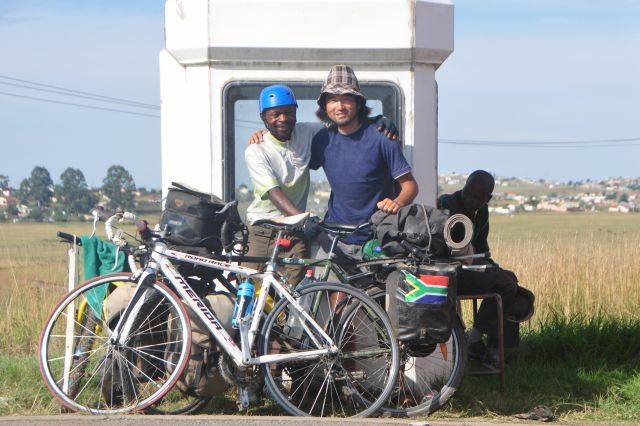 In general, cyclists feel happy when they find “comrades”. That’s the only reason. An old, white road bicycle, a blue helmet and jacket with a reflector, blinking red light fitted to the back of the seat, It seemed like he had much more common sense for a cyclist than I had. 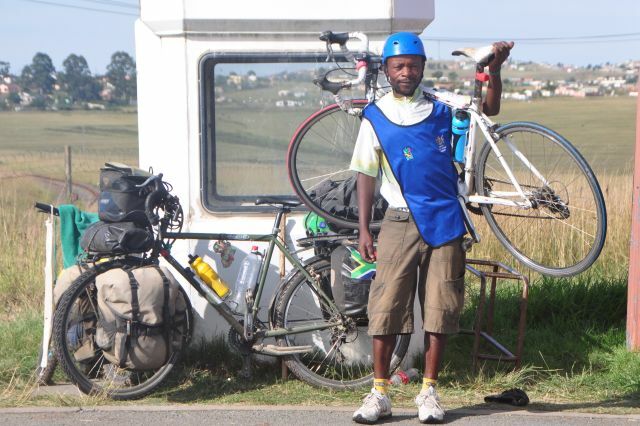 After introducing himself, the man, Mnguni, explained that he was trying to bring cycling and swimming to the children in the area without charge. It reminded me of a Kenyan professional bicycle racer, David Kinjah, I had met in Nairobi, who had his own NGO called“Safari Simbaz” for teaching the children, who had dropped out of school or had a problem at home, the skill as a mechanic and how to win the bicycle races to enable them to have a sustainable future for themselves. And Mnguni kindly invited me to his house, otherwise I would have had to ask the police station for a place to wait for the morning to come. ”Just a few km” Mnguni said, but in reality it was another 10 km further uphill to get to his house, this really exhausted me because I had been pedaling for more than a hundred km in the rain that day. With a brave smile I told him “In Africa 1km can mean 50km”, which had actually often annoyed me in Africa but he smiled at me with saying the same thing that he told me when we met at the junction, “It’s just right over there”. 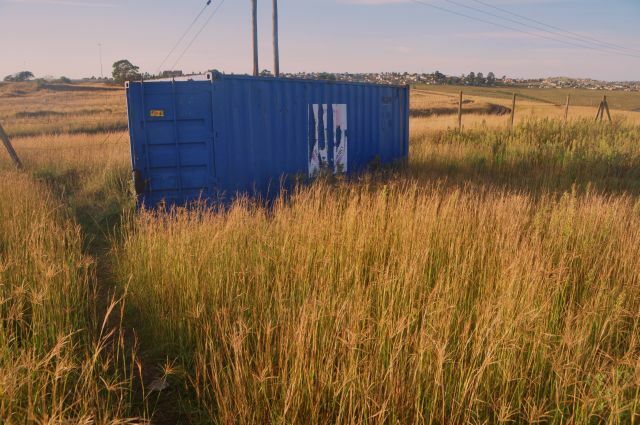 A blue container could be seen on the glass field in a suburban area called Ultra city.That was exactly where he had lived and happily I could sleep that night. The container was donated by the Department of Transport which had sympathized with his cause. 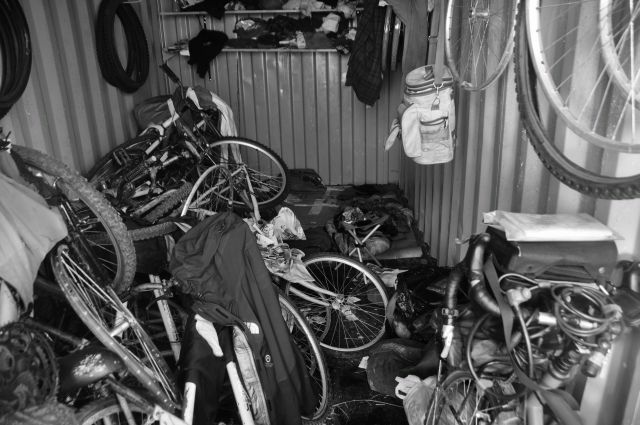 Inside the container was a mess of secondhand bicycles and its parts. I thought that my effort was rewarded. We would seldom have the opportunity to stay in a place like this. For me his house was far more exciting place than a well equipped five-star hotel to stay in. No water and electricity, no kitchen and toilet of course. He had lived in that container alone. I heard his ex-wife and three children had been living in a nearby town. After taking a cold shower and eating some bread at the gas station, just opposite his house across the road, where he went often, we started to put the things inside the container in order to make space. A beam of my headlight showed the dust rolling up in the room. Then he slipped into his sleeping bag on the cardboard sheet as usual and I followed to wrap myself in my sleeping bag next to him. Mnguni is 38 years old and used to be a triathlon athlete. He launched his initiative in 2005. Now some 20 children from 12-18 years old have been receiving coaching directly from him from Friday to Sunday, thrice weekly. 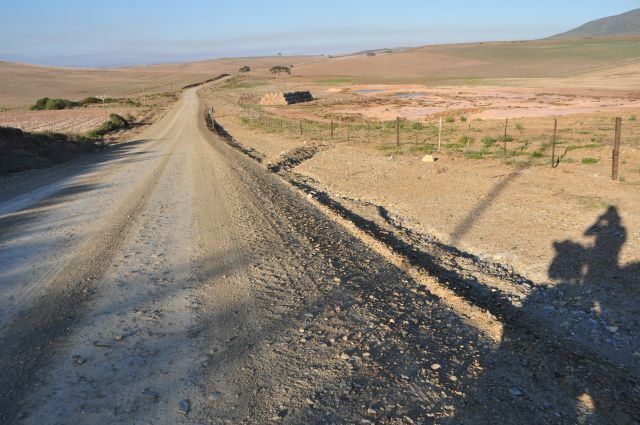 He obtained the formal qualification of coaching work for cycling and swimming three years ago through a four month training program at a school in East London with support from Department of transport. His activity has come to be recognized little by little. The children can’t find anything to do, get into drugs, start drinking and some resort to theft by poverty and idleness, especially around Mthatha.“I want to tell them through sports not to be lazy and they can live healthier”This is a his principle. His mother and father exiled themselves to Tanzania in 1970’s to escape imprisonment for involvement in their political activity against the apartheid regime and passed away there later. Mnguni and a his brother and two sisters were fostered at his uncle’s home as agricultural workers. Thanks for that he didn’t have time to learn ill deeds and idleness..
All the money for his activity comes from his pocket. 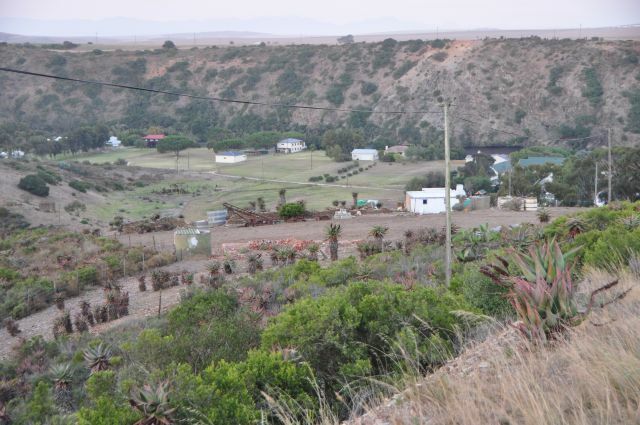 His primary business is cultivation and selling of plants, avocado, olive and yellowwood etc, and he earns about R2500 per month (270USD) with which he makes ends meet of his own livelihood and his activity, buying some used bicycle and its parts and paying the pool fees for children. 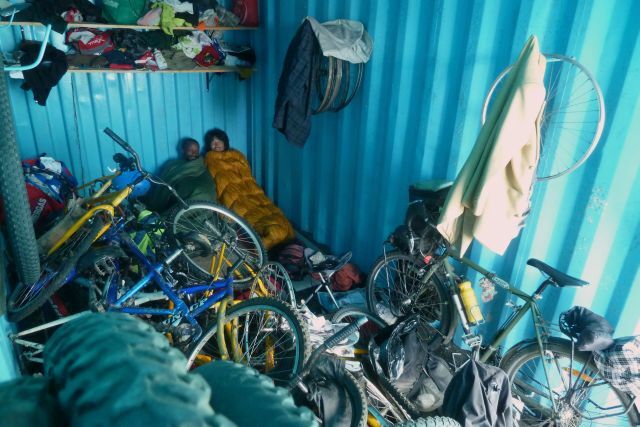 The only support for the activity he has gotten except his container is a free use of accommodation facility during two-day and one -night cycling tour to somewhere he plans sometimes, he told me. This is all I remember about this night. It seems my eyes had closed before the candlelight standing in between us flickered away and his story finished. It was a unique night spent with a number of bicycles and an honest man like him. He would be staring up at the ceiling alone in the blue container tonight. 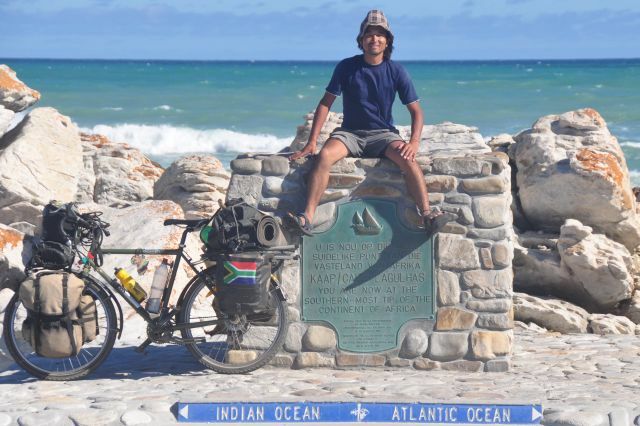 ※For more information about his activities or anyone that can provide some bicycle stuff you don’t use any more or has some ideas to share on how to improve their situation, please call Mnguni Male on 0837584552 from within South Africa or +27837584552 internationally. 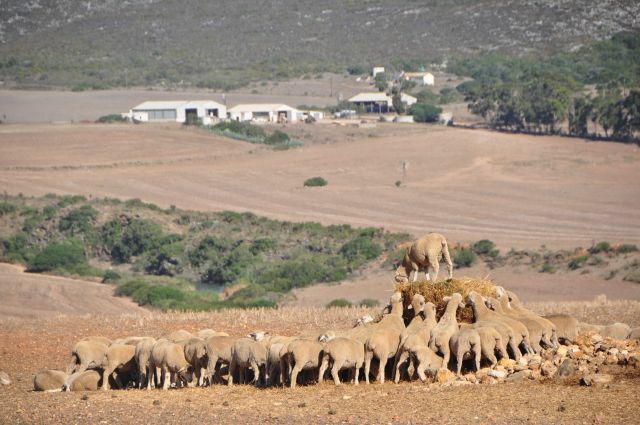 As compared with the famous Cape of Good Hope the neighboring Cape Agulhas is regarded for most visitors as less important. ”Why don’t you swim close to shore?” A beautiful lady with blonde hair who had been swimming there came to talk to me at the front of the monument which represents the southernmost tip of the continent. She was curious about my journey sadly not about me and told me she might contact me later as she worked for Cape Talk, a radio station in Cape town. The next morning I noticed my cell-phone vibrating and answered it while on the road where strong winds were blowing and had prevented me from understanding what she was speaking about, but what I could make out was that they wanted to have a live interview with me the next morning via phone. Later she asked me by SMS to be in a windless and quiet place come next morning. Prior to those two conditions she requested it was important for me to be in a place that could get good signal for my cell-phone due to the remote area I had found myself cycling through that afternoon. After pedaling 40km on an empty gravel road, I reached a village where there was no signal. I had wanted to rest but had another 20km to go with continuous, sharp up and down stretches of road before eventually I got to a riverside town called Malgas just before sunset. Contrary to my anticipation, there was unfortunately also no signal in Malgas. After getting a permit to pitch my tent aside of someone’s house, I visited a nearby house to explain my situation and ask them, a gentle married couple Jelly and Maline, to allow me to use their fixed telephone for the interview. Next morning 7am I was sitting at a table in their garden. This would be my first radio interview, windless and quiet of course. From the radio inside their house, I heard the presenter on the radio, Kieno, who would interview with me was speaking English at quite a fast pace, which made me quite nervous. A few minutes before the appointed time, ”the southernmost tip lady” called me and said “ready?” In a short while, Kieno changed the subject and started to introduce my story to his listeners. Over the next five minutes, my voice got on the air through South Africa. Thanks to him considering my level of English, I could manage it without making a big air accident.”Well done” Jelly smiled at me and ”An exciting moment happened in small and boring town” Maline kindly followed him. I didn’t know how widely it was broadcasted but Cape talk seems to be quite a well known radio station in South Africa, so the reaction was beyond my expectation. Some my South African friends kindly made calls or sent mails to me and the local people who listened my interview talked to me on the road and cheered me on. 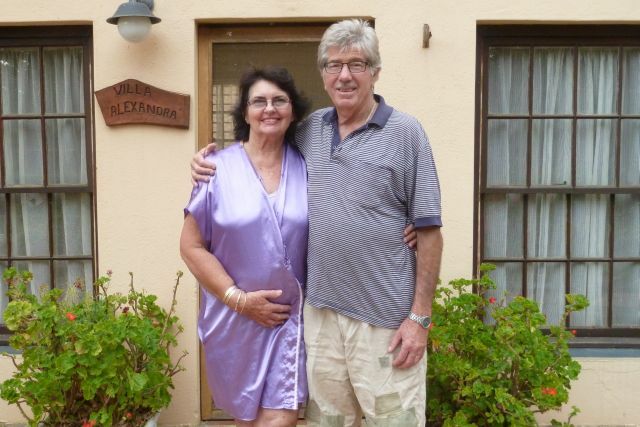 I was so happy to have been able to feel that it made me become closer to South African people. 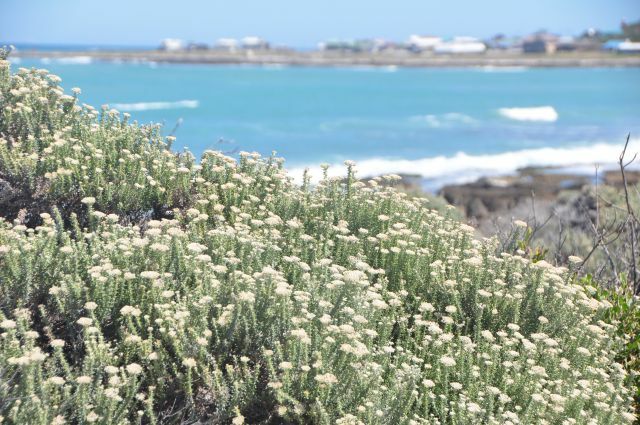 How about making a small detour to the southern tip of the continent ? A beautiful lady might be waiting for you.